Description: This simple graphic-style numeric invitation design works perfectly for a boy or girl first birthday, and really, for any age! It goes well with many different party decoration themes. 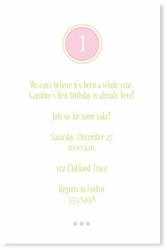 Choose from pink and green or blue and green or have us customize your invitation with your own color scheme.